You’ve faced the hard facts: you’re not the only one in your industry trying to get more traffic from search engines. Your competitors are pulling in search traffic that you need. Here’s how to yank it from them. A bunch of people who really want your product are looking for it online. Some of them are getting to your site. The same is true of your competitors. You’re both getting customers, readers, email subscribers, etc. because people are Googling stuff, seeing a search result that looks like what they’re looking for, and ending up on one of your websites. But you’re competitors. Those people who are happy to spend money on your competitor’s site may have been just as happy to spend it on yours . . . if you’d got to them first. Here’s the problem: Your competitors are pulling them in instead of you. Sometimes they’re just outranking you in search engines. But they’re also pulling in traffic for keywords you’ve never even thought of. Now, you could try to guess the search terms your competitors rank for. Or you could know for sure. I prefer to know for sure. I don’t have to ask you if you’re ready, do I? The first thing we need to do is figure out where your competitor’s traffic is coming from. This is where we’ll use that SEMrush tool I told you about at the beginning. Again, you can use the free version of SEMrush, but as I’ll show you later on, it’s going to severely limit your results on a project like this. That’s pretty easy. 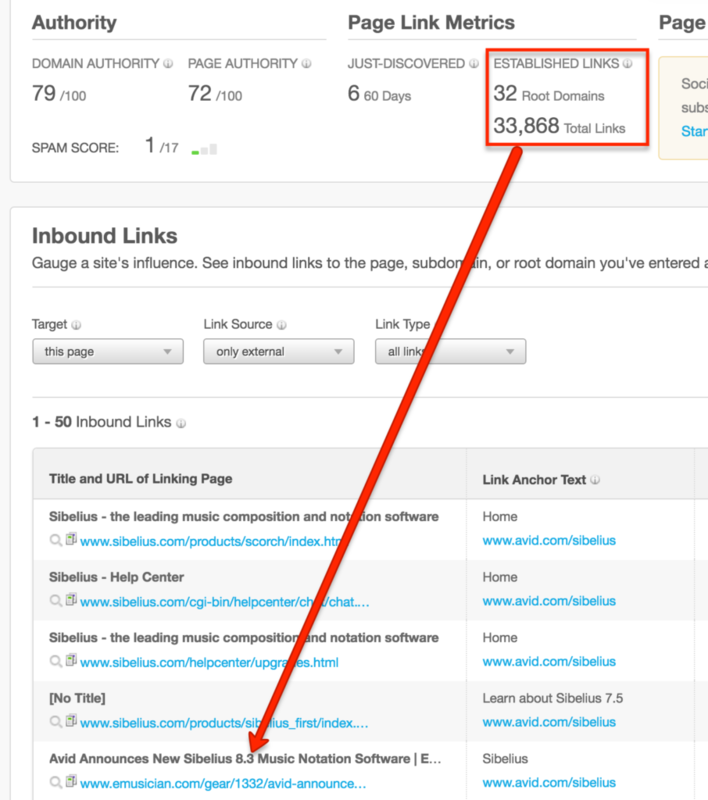 If you’re using SEMrush for the first time, you’ll just plug your competitor’s main URL into the home page, like so. That will pull up a lot of information about your competitor’s website: an estimate of how much organic traffic they get, a run-down of SEM advertising activities, etc. But you’ll want to scroll down to the “Top Organic Keywords” section and click the blue “View full report” button. Right across the top, I can see that Avid ranks for about 116,000 words, and gets an estimated 221,000 hits from search engines every month. But once you look past the flashy charts and big numbers, you’ll see a long table of keywords. This is what we came here for. Keyword column is obvious: that’s specifically what people are Googling. Pos. is for “position,” which indicates how far up or down the list of search results your competitor is when people Google that keyword. Volume represents approximately how many times that keyword is Googled every month. CPC is another obvious one: it’s the approximate cost per click you’d pay for this keyword in Adwords. 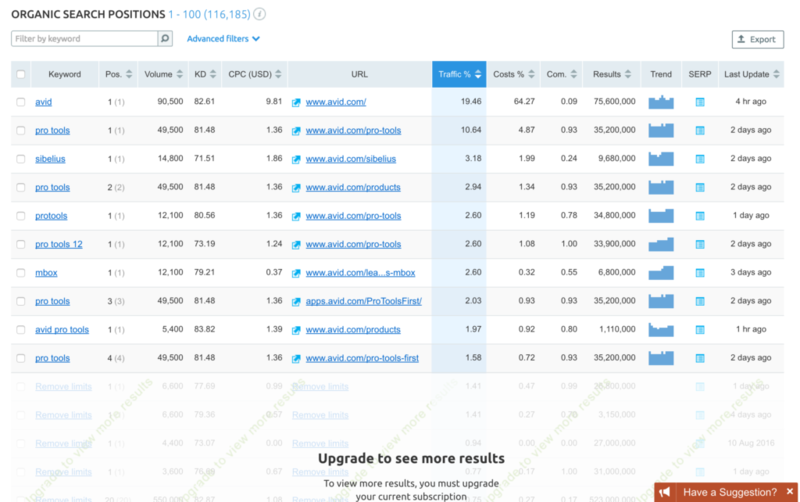 URL tells you which page of the competitor’s website is ranking. Traffic % tells you approximately what percentage of your competitor’s traffic comes from this keyword. The other columns aren’t very pertinent to what we’re trying to do here. You can do this by hitting the “Export” button and selecting how you want to download your list. You’ll want to throw that list into a spreadsheet somewhere. I like keeping stuff in Google Sheets, so I’ve set it up there, complete with filters across the top row. What does my competitor rank for? 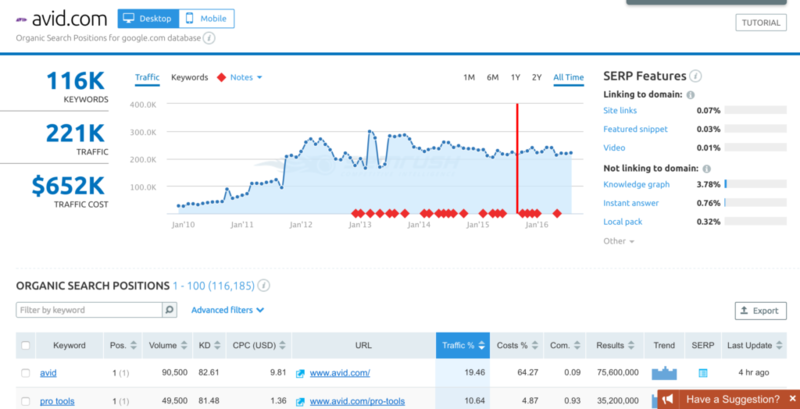 Where is my competitor’s organic search traffic coming from? Which keywords are most valuable to them? Can you imagine dropping this kind of knowledge in your next meeting with execs? How many other people in your company know this info? How many people at your competitor’s company do you think know this? Yeah. Not much. You walk around with this info and you’ll feel like a marketing demigod. And we’ve barely even started yet. 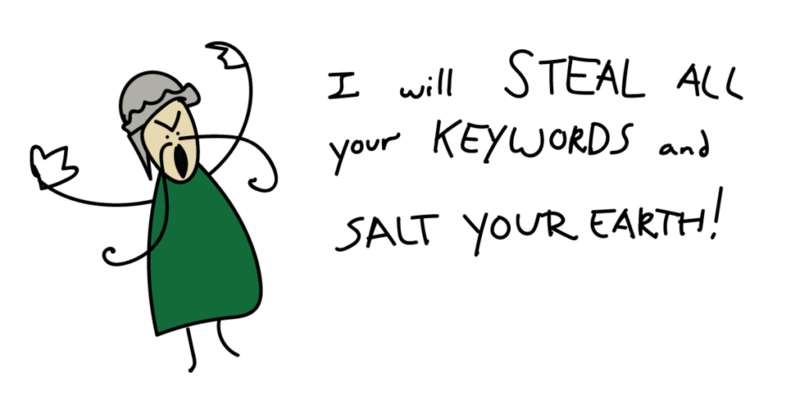 It’s at about this time that we see all of these keywords and start channeling our inner SEO Atilla the Hun. We don’t want all of their keywords. Just the ones that will help us. So now we need to weed this list of keywords down. Some of your competitors’ keywords have nothing to do with you. There’s nothing you could offer that could satisfy the people searching for them. Don’t waste your time on these. For example, Avid ranks #10 for “film reel.” Finale is a music notation and composition software. I have no need to rank for “film reel.” It’s irrelevant, and I’m not going to waste my time on it. Some of those keywords are too difficult to justify the effort. Back to the Finale example: it’d be sweet to steal all the traffic for people searching for “sibelius 7 free” and get them to try Finale’s free trial instead, right? Maybe, but that’s going to be really, really difficult. SEMrush puts that keyword’s difficulty at 83, and there are only 10 monthly searches for it! That’s way too much work for so little payoff. SEMRush’s keyword difficulty score is really helpful, but that’s not the only tool you have. If you’re not sure how difficult it would be to rank for something, just pull up an incognito window and search for the term. Look at the first page results and take note of how well they answer the search’s intent—things like article depth, relevance, trustworthiness, etc. Looking at existing results can be extra-helpful while you’re still getting a grasp on what different keyword difficulty scores represent. I’m leaving this one open-ended, because this activity is going to depend on what kind of competitor you’re dealing with. But for this exercise, I’m not trying to steal search traffic for the keywords that are part of my competitor’s brand. So that means I’m filtering out any keyword that is about Avid or one of Avid’s products. I might circle back around to try to take Avid’s search traffic for branded keywords later, but as of now, I’m just not interested in going down that road. I don’t have an example in the niche world of music notation software, so let’s say hypothetically that Avid ranked for “music.” Just “music,” which gets more than a million monthly searches. But how many people Googling “Music” are at all interested in software for writing sheet music? Probably not many. It’s a relevant keyword, but the intent to ever buy your product is negligible. In some ways, the keyword is fool’s gold. That’s not the kind of traffic you’re trying to take from your competitor, is it? You might note that I didn’t say, “delete shallow-intent competitor keywords.” That’s because you might find yourself in a place where you can experiment with ranking for these words. But you don’t want them to distract you from the more reliably profitable keywords. OK, so by now, you should have a list of keywords that your competitor ranks for—and that you want to steal. 3.a Generate that Organic Research Report for your own website. Walk through Step 1 for your own site. But this time, add the results to a second tab on the spreadsheet you’ve already been working on. 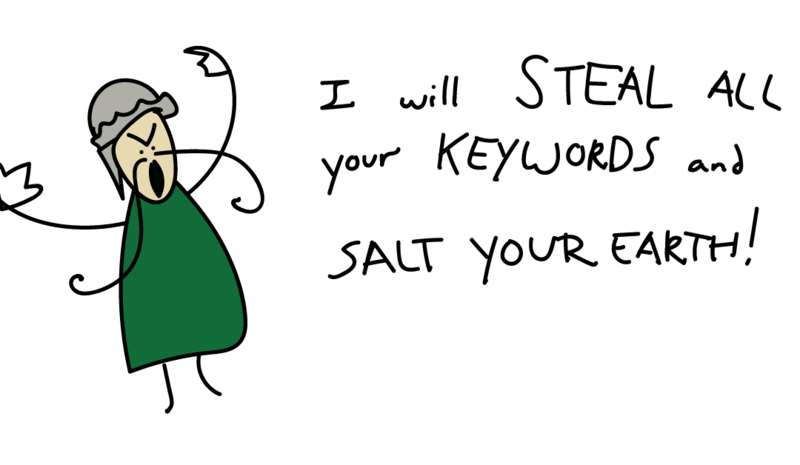 Which keywords does your competitor rank for that you don’t? Which keywords do you both rank for, with your competitor outranking you? Which pages on your competitor’s site are getting all this search traffic? I like to set up a VLOOKUP formula in the spreadsheet that shows how my search position compares with my competitor’s. But that’s not always necessary. Now that you know what you and your competitor rank for, it’s time to assess what needs to happen in order to steal their organic search traffic. The competitor’s domain authority. This is a number between 1 and 100 that ranks the root domain’s potential to rank based on a series of factors. The higher the domain authority, the more potential any page on the site has to rank. The competitor’s unique page authority. This is also a number between 1 and 100, and it measured the specific page’s potential to rank in search engines. Backlinks are still one of the main factors that influence a page’s ranking in search engines. You want to see just how much this competitor’s page has been referenced by other sites. For a while now, blog posts of 2,200 words or more have been dominating the top search results. If your competitor is ranking for a keyword with a blog post that’s only 800 words long, there’s a good chance you can outrank them with a longer post. You will need to find your own site’s domain authority, as well as the authority of pages that rank behind your competitor’s. Write a new piece of content that totally surpasses anything they have. Bolster an existing piece of content so that it’s strong enough to outrank your competitor. ^Both of those strategies take time, effort, and/or money. It involves a lot of writing (either your time and effort or your time and money for someone else’s time and effort). It’ll involve checking and re-checking and re-re-checking the SERPs. At Overthink Group (my agency), it can take us up to 20 hours just to write a long-form, competitive blog post. That’s with a professional writer on the job (who writes rather quickly). And that doesn’t include the time it takes to reach out to other websites for backlinks, email people about the new article, and all that great content promotion stuff. You may need to prioritize a few crucial search terms to go for first. For example, let’s say your competitor ranks for two equally valuable keywords. One of those is defended by a 6,000-word superarticle with links from very reputable sites. 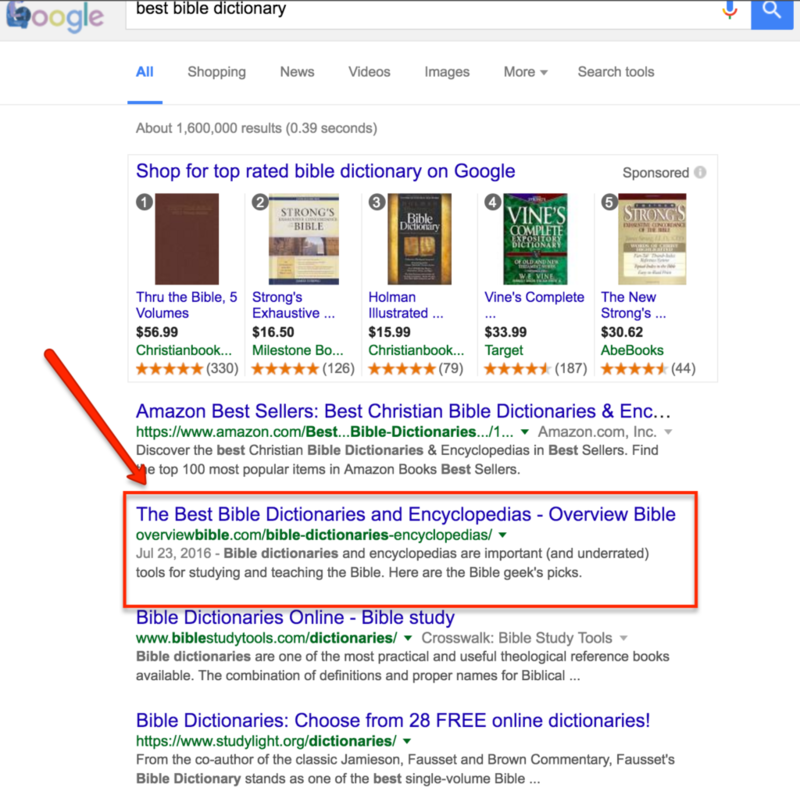 The other keyword is only backed by a 750-word stub with two links, both from other pages on your competitor’s site. Choose to tackle the latter first. Once you’re ready to move forward, well, it’s time to move forward! The more words you use, the more synonyms for your keyword you will end up using. That means your article about “what sharks eat” will include terms like “shark meal,” “shark diet,” “sharks consume,” and “feeding frenzy”—all terms that people are searching for when they want to know what sharks eat. The longer the article, the more relevant links you can use. When search engines see you linking to pages about the topics you’re writing on, it signals that your content is relevant to those topics. Current content gets shared by VIPs. People look to big-name bloggers, speakers, and social media personalities to keep them up to date on their topics of expertise. If you can give these big names something relevant and timely to share, you’re doing them a (very, very small) favor. If you’re writing something more current than what your competitor wrote, then you have years’ worth of new content to link to. Surely there are new reports, new interviews, new blog posts, etc. that were written after your competitor wrote their piece. You can link to them. Think of how the language around a certain topic changes over time. New tools are created. New businesses form. New buzzwords are born. By writing a more current piece of content, you can use the new terminology that has only existed after your competitor’s old piece was written. People will spend more time on your page, which signals to search engines that your content is valuable. People will share content that they can quickly understand. Be more thorough. Does the other guy give the reader high-level, big picture points? Do your readers one better: list out every single step of a given process, every detail to consider in a decision, every last piece of info. Write the exhaustive, end-all piece on the matter. You got this. Go forward with the wisdom of Solomon and the strength of 20 barbarians. Once your piece is written and published, it’s time to move on to the final step. The worst thing for you to do at this point would be to hit “Publish” and then sit around waiting for your competitor’s traffic to come your way. No. You need to get out there and promote your awesome content. Promotion is key for a few reasons. First, people can’t share or reference your article if they don’t know it exists, and a quick influx of traffic and links is the best way to start stealing your competitors’ organic traffic. Secondly, if you have the content, why only make it available to organic searchers? Put it to work for you with your existing audience, too. 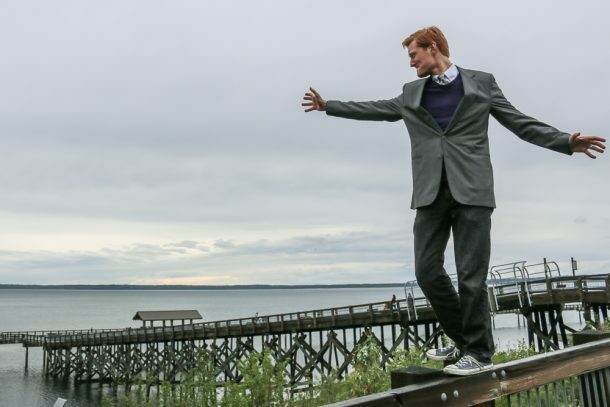 Use the “Moving Man” method to turn broken links on other sites into links to your new content. If you’re offering a product, give it away for free to influential bloggers and ask that they consider mentioning it on their blog. Obviously, there are other ways to get the word out—but these will get you started. GOOD JOB. Now, how do you know it worked? There are a few ways to check up on this. It’s our old friend, SEMrush! They let you set up a dashboard that tracks how your site is performing, what keywords you’re ranking for, what pages are pulling in organic traffic, etc. Want to do a quick check? Open a Google Chrome incognito tab and see what results Google shows you. Looks like I’m #2 (after those shopping listings). Select “Organic,” and set your secondary dimension to “Landing page” (in the “Behavior” category). Select the URL for the page you’ve been working through these steps on to see how much traffic it’s brought in organically over time. Way to go! Want to know more? I’m a guy who quit his job to start an agency doing this kind of stuff. Every once in a while, I share what’s working for us on my blog. I’d love to let you in on all the cool stuff we learn so you can do better content marketing yourself. I left my regular job to start an agency doing what I love—and getting paid what I wanted. Join my email list and I'll send you thoughts on how you can do the same.